In 1814, Jeremiah Colbertson purchased lot 41 from Andrew Stroup. He also owned several other lots, in addition to a tavern as was mentioned in his will. Colbertson sold the lot in 1830 to George Smith, a carpenter, for an unknown sum of money. Smith owned lot 41 for fewer than two months, and in 1830 he sold the property to David Swineheart for $30. Tax records list Swineheart as owning a house and lot in 1832, but the $30 sale between Smith and Swineheart suggests that there was no structure on the property since many similar sized lots with homes were being sold for $500 or more. Apparently the house was built between 1830 and 1832. From 1832 until about 1840, Swineheart resided in the house he had constructed on this lot. By the turn of the 20th century, records indicate that there was a carriage house or stable, blacksmith shop and a smokehouse in addition to the main house on the property. Subsequent owners were: Peter Keichline a blacksmith, Jacob Condo also a blacksmith, George Hosterman a farmer, and George Rowe. The house passed to the Dale family in the 20th century. The building on lot 41 at 120 West Main Street in Boalsburg Pennsylvania is a two story, three‑bay log structure with a covered porch and a side entry to the right of the facade. The front reveals no apparent transformations, but there are obvious changes apparent from the rear. 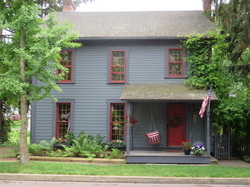 The exterior is blue clapboard siding and the facade contains five six‑over‑six sash windows. Both gable ends have red brick chimneys; the east gable end is attached to the original fireplace. The floor plan has a side entry, two‑room layout. The main entry opens into a hallway that looks straight out of the backside of the house through an original door. The entry hall includes an expansive staircase that leads to the second and third floors. There were originally two rooms on the first floor, divided only by a wall with separate doors leading from the hallway. The fireplace existed only in the back room, and was completely covered up when the Kellys moved in. They uncovered an impressive work of masonry that was riddled with stovepipe holes. The wall separating these two rooms was removed, creating one large living area. At one point, both of these rooms had used stoves as the only heat source. Also, the fireplace was covered up, and only used as a means for the escaping smoke. Around the same time the dormer gable was added to the street‑side facade, the windows in the front room were altered to give the house a more Victorian look. However, it is unclear which owners added these elements. All of the flooring in the house is wood, and the planks get wider and less sophisticated as you move consecutively through the three stories of the house. The second and third floors are less changed. The second floor has three original interconnected rooms that now are; an office space, a leisure space, and a midway room to the bathroom located above the summer kitchen. There are indications that a wall had existed between the two rooms adjacent to the stair. The wall between the two rooms parallel to the facade was most likely moved toward the rear of the house. The only major alteration on the third floor was the addition of the dormer and window that the Kellys had added to allow more light into the bedrooms. There is a closet on the summer kitchen side of the house that reveals the brickwork of the original fireplace. The house has an array of unique features, including ironwork by the original blacksmiths that resided in the house, and woodwork that is hand‑done.